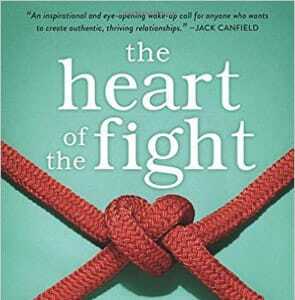 Fighting in a Relationship: You’re Doing It Wrong & Other Lessons From "The Heart of the Fight"
Why do couples fight? Despite sincerely loving and caring for each other, people in committed relationships will disagree, argue, and fight. “The Heart of the Fight” teaches couples how to argue in healthy, productive ways. 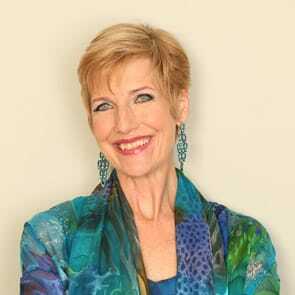 Dr. Judith Wright, a couples and lifestyles coach, speaker, consultant, and best-selling author, and her life and work partner Dr. Bob Wright, an internationally recognized visionary, speaker, educator, and best-selling author, have worked in relationship coaching helping thousands of couples who seek to make their unions worth fighting for — and their fighting worthwhile. 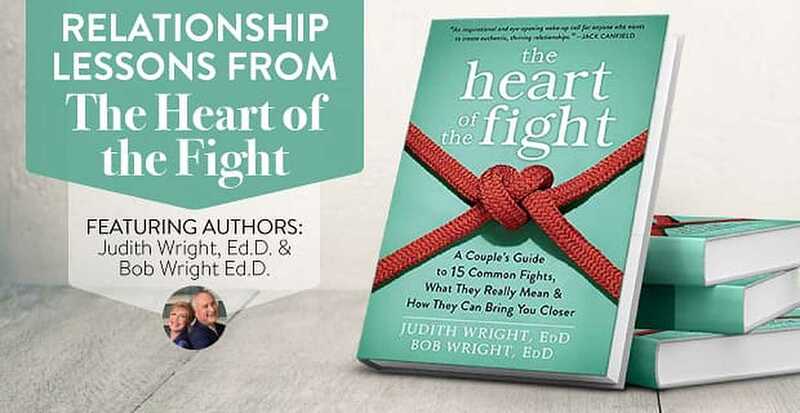 In their 30 years of research and leading couples programs, the Wrights have developed a keen understanding of how to help couples get to the heart of their conflicts. Their research reveals what’s really behind petty fights and how couples can learn to grow more intimate and loving by learning how to fight. Judith and Bob say they also happen to live out the process of conflict resolution and completion in their own relationship of almost 30 years. Most dating advice is filled with tips on how to make the best first impression on a first date. But what if people took to heart the most basic advice offered in every kind of relationship — be yourself. The real you. The person you haven’t rehearsed in your head. Judith remembers her first date with her now-husband. “If you start a (relationship by) manipulation and withholding, unconsciously you are setting a foundation,” Judith said. Studies show 100% of dating couples lie, said Judith. In a misguided effort to be liked, people who are just starting to date withhold what they really think and feel. It’s like holding your breath in a relationship and hoping for the best. Starting out from date No. 1 to be the real you and inviting your date to be real from the beginning means being willing to tell the truth. Years of research and working with couples point to this simple but challenging truth. The truth is a great relationship doesn’t happen thanks to the absence of disagreement. On the contrary, say Judith and Bob. If you want a relationship that is intimate, affectionate, and that satisfies, then learn how to fight. Couples who challenge each other are more willing to tell more truths, and the results are deeper intimacy and trust. A great relationship requires great fights, said Judith. But it’s not just any kind of fighting that brings couples closer and makes them stronger, say the authors. Most people think of fighting as destructive and uncivilized. Fighting is associated with immaturity and an inability to resolve conflict. But, the fact is, the kind of fighting that leads to a stronger relationship isn’t the winner-take-all, I’m right/ you’re wrong battles of conventional thinking. Instead, productive fighting is where the outcome helps a couple gain a deeper insight and trust of the person they love. It gets to the underlying issues of the blame game, the dueling over dollars, family feuds, and sexual dissatisfaction, which are among the kinds of fights the Wrights most frequently encounter in their work. In studying couples with thriving relationships who were also successful in other areas of their lives, the Wrights arrived at a groundbreaking conclusion: the same process that leads couples to work out and learn from their conflicts also primed them for success in all areas of their lives. Simply stated, productive fights only happen by learning how to do it right — and most people don’t know how to fight. Fighting is not for losers, which means learning how to do it right so the outcome helps couples move forward is key. And it starts with some basic skills and ground rules. An important step in doing it right is taking ownership of the outcome of the fight. It’s up to you to learn the skills to focus on the root causes of the conflict and actively listen to your partner to better understand his or her position. Accepting responsibility for the success of the process is powerful. Human beings are wired to yearn. Our yearnings drive us to seek security, to bond with others, and to love and be loved. Unmet yearnings manifest themselves in a range of sentiments: from a vague dissatisfaction to an undefined longing to straight-out fights. Becoming aware of what lies beneath the dissatisfaction is like developing an inner GPS that leads to what’s really bugging us. It frees you to say what is really bothering you and to ask for what you need from your partner. It also means you understand what’s truly behind a seemingly petty fight. Not learning how to listen to your yearnings builds resentment while acknowledging them validates our most basic needs. Studies show people who fulfill their inner yearnings are successful in life in general. A loving relationship takes work. It means not just being real with your partner so your needs are being met, it means deepening your understanding of what your partner needs from you to be satisfied and appreciated. In short, it means engaging, the roll-up-your-sleeves, dig-in kind of engagement. There will be mistakes in the process. All that engaging will get messy. But what happens when couples work to be honest with each other, all the time, every day, is that they each become the most authentic and real versions of themselves. Encounters become fresh, exciting, and more trusting. “All of us yearn for a better relationship, to love and be loved,” said Judith, who is co-founder of the Wright Foundation for the Realization of Human Potential, a nonprofit organization dedicated to helping individuals bring out their best personally and professionally. A loving relationship means engaging — the roll-up-your-sleeves, dig-in kind of engagement. The truth is most people do not have the skills to have great relationships, thanks to well-intentioned advice on personal relations from parents, teachers, and friends. What it takes to have a great relationship is so different than what most people think, said Judith, who is also co-founder and professor of transformational coaching at the Wright Graduate University for the Realization of Human Potential. True intimacy requires lots of engagement, in which both partners are truthful and real with each other where no one gets more than 50% of the blame and you each get 100% of the responsibility for your happiness and satisfaction. Remember, you are fight for your relationship, not against it. Fights are rarely about the topic at hand. That’s just the tip of the iceberg, and not drilling down to the heart of the matter is a missed opportunity to know your partner — and yourself — more intimately. Judith describes moving past the surface of an argument as getting to the underbelly of a relationship by revealing what is really bothering us. In the process, we not only share who we really are with our partners, she said, we often lay bare mistaken beliefs and assumptions in our own feelings. The effect of our past on our present relationships is complex and often limits our ability to interact. Memories from the past are stored deep in the recesses of our brains and, when we are upset, they rear their heads to shape our present experiences. From infancy, our interactions with our parents create neuropathways that establish beliefs, feelings and behavior patterns. It is a matrix, as the Wrights call it, of our sense of self, our beliefs about others, what we expect from the world, and what we think the world expects from us. Society also plays a part in programming what we believe. For a relationship to be successful, a person must start by recognizing that some core beliefs (“I’m not good enough.” “I have to earn love.”) are just plain wrong. Revealing requires learning to recognize reactions that are out of proportion to present events. When we bring this to conscious awareness, we can understand what is really going on with us, why fights often feel so stupid on the surface, and what unfinished business needs to be tended to. People find if they interact authentically, they move beyond the frustration and the pain to the joy that comes with understanding themselves and their partner better. Breaking free from our established matrixes that limit beliefs about ourselves and beliefs about relationships, including fighting and intimacy, doesn’t happen overnight. Liberating happens in small steps: thinking the next riskier thought, saying a little more truth, going one step further into a conflict, making the next move to break old relating habits. These are not affirmations. Liberating is something you do, not just think about. 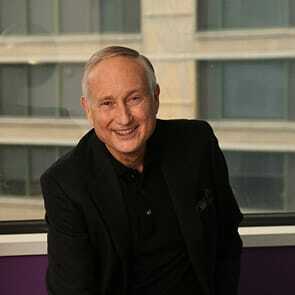 The Wrights have developed a system of daily life assignments to challenge limiting beliefs and develop new thinking, acting, and feeling patterns they call the assignment way of living. Challenge your beliefs about relationships and stop worrying about preserving the status quo. It entails trying out new behaviors that are consistent with new, empowering beliefs about ourselves. In tackling the mistaken belief that we don’t matter, for example, we would replace it with the empowering belief that our feelings and thoughts are valid and identify specific actions to implement that belief. Those could include asking for what we want at least once a day; experimenting with following a yearning at least once an hour; or expressing our preferences five times a day on issues ranging from what’s for dinner to where to go on dates. Liberating is also about challenging our beliefs about relationships, which are often based on an old model that all about preserving the status quo, championing those who don’t rock the boat, don’t get angry, and just try to get along. Liberating goes against the old rules, but remember: you are breaking the rules to have the best relationship you possibly can to become the best person you can be. 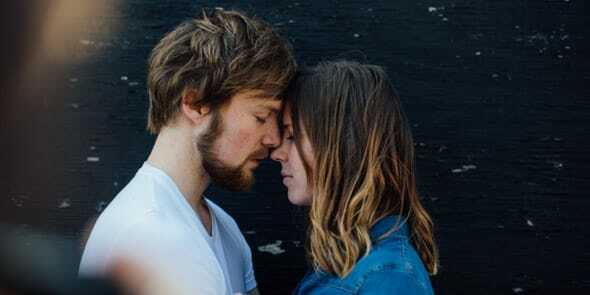 In their couples research, the Wrights have identified liberating actions that break old relationship rules, build a new model of relating, and take the relationship to a new level. They include saying what you think and feel, talking about the big stuff like your hopes, fears and dreams, and dealing with the small stuff so it doesn’t fester into big stuff. Once you’ve experimented with breaking out of your mistaken beliefs in liberating, you begin to consistently work with resolve to live a new way, which is the next bliss skill. Rematrixing means adding to and repeating, with resolve, the moves you make in liberating. Without the discipline in rematrixing, you might improve your relationship, but it will drift back to what it was before or even become worse. It will take time and resolve because lasting change requires repeated, constant stretching into new beliefs and behaviors. The best moments for rematrixing are when you are fighting. Fights provide the perfect opportunities for brain-changing. This is when the unfinished business of your matrix is surfacing and can be addressed. Your fights then become an integrated part of the process of transformation. Your relationship arguments cease to be something to resolve, get over, or prevent — they become the catalyst for an evolving relationship. Rematrixing happens thanks to the brain’s neuroplasticity — the ability to build new neural circuits of beliefs, behaviors, and relating that create a new you and a new relationship. The process requires highly focused attention, novelty, stretching into new skills a bit outside of our comfort zone, and repeating new behaviors. All of the previously mentioned skills — yearning, engaging, revealing, and liberating — come into play. The process can happen at any stage of life. Empty nesters, for example, have to build a new basis for their relationship facing issues they may not have had to face during their period of child-rearing. Dedicating means you are committed, as a way of life, to getting to the heart of the fights and unlocking their meaning. You no longer avoid disagreements, altercations and upsets because you know you can work through conflict by applying the bliss skills, learning more about yourself and your partner and growing your relationship. When couples are dedicated, they learn to live purposefully together and as individuals. Dedicating means continually choosing challenges, individually and as a couple, to keep you stretching and growing. When you’re dedicating, you learn to live purposefully as individuals, as well as a couple, changing for the better, forever. This step requires reorienting from cultural myths about marriage and dedicating yourself to a mutual journey of learning, growing and transformation. Dr. Judith and Dr. Bob Wright each have over 30 years experience working with couples in their Wright Foundation couples program. What they kept seeing over and over again was that the problems couples faced in their marriage together invariably had their roots in their childhood upbringing and showed up in first dates and throughout the dating relationship. Judith and Bob have worked with couples for over 30 years at The Wright Foundation. The reality is most couples spent loads of time planning their wedding and almost zero time planning their marriage or developing the skills they need to have a great relationship. As a result, the Wrights started doing more and more premarital coaching helping couples plan for the challenges to come as well as learn to create a shared vision to help navigate those challenges. What really kept expanding was a full program and training to help couples — from being a dating single to long-term marriage — learn the skills they need to create a great relationship. And it hasn’t stopped there. They even teach 7 Rules of Engagement in “The Heart of the Fight” to high-level executive teams because what works in relationship works — whether you are in the boardroom or the bedroom.